It’s getting as if there may be no leaving the call of the boxing ring after all, as recently retired Filipino 8-division world champion prizefighter and now-Senator Manny Pacquiao have released ambiguous statements alongside promoter Bob Arum of Top Rank Boxing that there may perhaps be more matches in store for “Pac-Man” in the future. 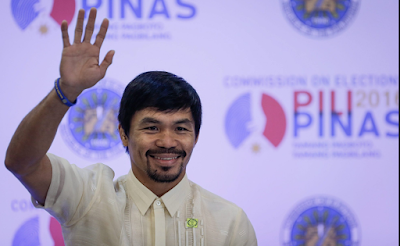 Barely three months after announcing his retirement upon defeating American Timothy Bradley last April, and not even three weeks into his tenure as a Philippine Senator, Pacquiao’s name has been dropped by Arum as eyeing a return to the boxing ring as early as this coming November, against an opponent who is yet to be determined, according to BBC. If true, these feelers would prove prophetic the conviction of Pacquiao’s long-time coach Freddie Roach that his boy “Pac-Man” would keep boxing forever if he could get away with it. Needless to say, these remarks have sparked a firestorm of reactions, most of which he towards criticizing the fighting politician’s wishy-washy resolve and expressing fears that Pacquiao, who was swept into the Philippine Senate after time in the House of Representatives more on his sports credentials and popularity than political acumen, was not actually so dedicated to his so-called vocation after all, and is looking to make more money even after being recognized as the richest incumbent legislator in his country. The Senator’s net worth as of his 2015 Statement on Assets and Liabilities numbered around $69 million, or 3.2 billion in Philippine Pesos. Bob Arum meanwhile is firmly of the opinion that Pacquiao loves both boxing and the attention he gets from it. He has even confided in The Guardian that the Senator already has the go-ahead from the Philippine Senate President Franklin Drilon to begin training the moment the country’s National Budget for the following year is finalized in session on mid-October, the better not to cut his training into his lawmaking duties too much.